I often get asked to write posts on various topics, and while I wish I could commit more time to this space, I really just can't! So instead of having a bunch of unfinished posts in my drafts, I'm going to do a little rapid fire sharing thanks to some of your requests. I'm always happy to answer questions, so feel free to ask away! Will you share more about your healthy cooking & eating habits? I'll start by saying our eating habits aren't perfect. I love my sweets especially! But I am very conscious about what I put in my body as well as the boys. We make almost all our meals at home (and from scratch), rarely eating out. We don't eat paleo, or clean, just good whole foods. We try to avoid processed foods as much as possible as well as all the low-fat/no-fat nonsense. But as with everything, we just try to have a sense of balance in our diets. For finding recipes, I love Cooking Light! I get their magazine monthly, but you can also find all of their recipes online. Costco often carries their cookbooks. Conor jokes that "cooking light" is really just "cooking with white wine"! I also have plenty of my mom & grandma's recipes, that I tailor at times. Whole Foods often has good recipes, which searching through is super easy. I try to really focus on good proteins and fats for the boys, as well as probiotics (a healthy gut is a happy gut). For that they take a daily supplement as well as enjoying lots of kombucha (I brew my own as well as buy it), kefir (want to try and start making my own), & greek yogurt. We also make sure to buy high quality, nutritious foods. Most of our milk, eggs, cheese are organic. And then for meat, I focus on hormone & antibiotic free. For beef we stick with grassfed and actually bought a quarter of a cow recently. Cannot recommend that enough! You just need a deep freezer to store the meat. We are considering doing a pig next. I also made the switch to only grassfed butter after encouragement from our pediatrician. He has been a wealth of knowledge and is always giving me small ways to improve our eating habits. Vegetables are a real struggle with both boys, more so Liam than Finn. But I know that the more they see Conor & I make healthy choices, the more they are curious and want to try new foods. They also seem much more willing to try things in summer when our own garden is flourishing and there are tons of samples at the farmers' market! How do you get your boys to nap together? Can you share more about nap time & bedtime routines? This question has been asked a lot recently since I often share a little clip of us all snuggled up together for nap time on my Instagram story. Liam doesn't "need" to nap, but with all these warm summer nights, we have been staying up much later. He knows that if he naps, he can stay up til the sun goes down. Plus, he knows I like to sleep with Finn (especially while pregnant), so there's no FOMO happening. It would be pretty boring in the house with Finn & I sleeping. So after lunch, we all climb into my bed, read two books, then snuggle up. Liam is usually out before Finn, who fights nap time occasionally. But they know nothing fun is happening until we sleep. It works well. I often fall asleep too, or sometimes I just stay curled up between them and catch up on blogs, news, a book, etc. Bedtime is similar. Bath, jammies, books, lights out. Conor & I divide and conquer at bedtime, and we try to switch up who we put to sleep. We still lay with both boys until they fall asleep. Bedtime is around 8pm if Liam didn't nap; if he did, it's around 9pm. Wake up time is typically between 7:30-8:30am. Liam sleeps through the night about half the time; Finn occasionally. So usually, we wake up to both boys in our bed come morning. Our master is on the main floor, so we never take them back to their own beds. Plus we love cosleeping! How did you potty train Finn so young? We don't use any methods or special programs. Liam potty trained at his own at 2.5 years. He did it in a week, nighttime included. Around 18 months old, Finn started showing signs that he was ready. He would often be dry for long periods of time, sometimes say "pee" while he was peeing, and trying to take off his diaper. We cloth diaper, whether this was a factor in his wanting dirty diapers off more quickly or not, I'm not certain. With all these factors in place, we pulled out the little potty and let Finn be naked around the house, prompting him to go often. There were plenty of accidents in that first week! But he also really seemed to be getting the idea and using the potty too! After a few days we started wearing undies out of the house. It took a couple weeks, but eventually he was potty trained for all day & nap time. And while occasionally he would wake up dry in the morning, we still put him in a nighttime diaper for the time being. About a month in (around 19 months) he had a huge regression. Accidents all day long. It was strange. But we knew he was capable, so we kept things positive and kept prompting him. It was just a minor setback, and all was well again a week later. I waited to get rid of the nighttime diapers until after he weaned (around 21 months old). From then on, he was completely done with diapers. If he wakes up during the night currently, we have him use the potty then. Accidents happen occasionally, but rarely. It has been amazing to have a kid potty train this young!!! And I'm even more thrilled not to have two in diapers when baby arrives! Our absolute favorite undies for the learning stage are Kickee Pants trainers (they run a little small). They are extra thick through the middle and absorb so much! Often we would just need to change undies instead of pants too! My biggest piece of advice is seriously just to wait til your kids are ready, but capitalize on it when they are you, because you can miss the window. It was such a breeze to not force it on our boys. No tears, no frustrations. Will you do a roundup of your favorite boys clothes? I am going to try to do this more often! I buy from a mix of small shops as well as the big box stores. On instagram, I always try to tag the small shops. When I'm not shopping small, most of the boys' clothes come from H&M, Gap, or Target. Occasionally Old Navy, but I really don't think their quality is that great. Shopping those stores is all about sifting through everything (best done online) to find things that fit their (or your style). I'll try to put together some current favorites soon! Hopefully this was helpful for all who have asked! Feel free to leave any blog post topics in the comments! Ok. I need to do the little potty with Julia. She'd go diaper-less all day if I let her. And she announces (about 85% of the time) if she's peed or pooped (TMI??). And I'm all for boys clothes round up! I'm *always* looking for cuter clothes for Marcus. Once you have 'fresh' beef, it's hard to eat anything from the store (I think), it's so good!! Oh! If you find a good kefir recipe, please share! Im about to commit to potty training Brielana (now that I have summer off) and am kinda dreading it as Kinsey was SO EASY. But everyone is different, right? Gotta stay positive. 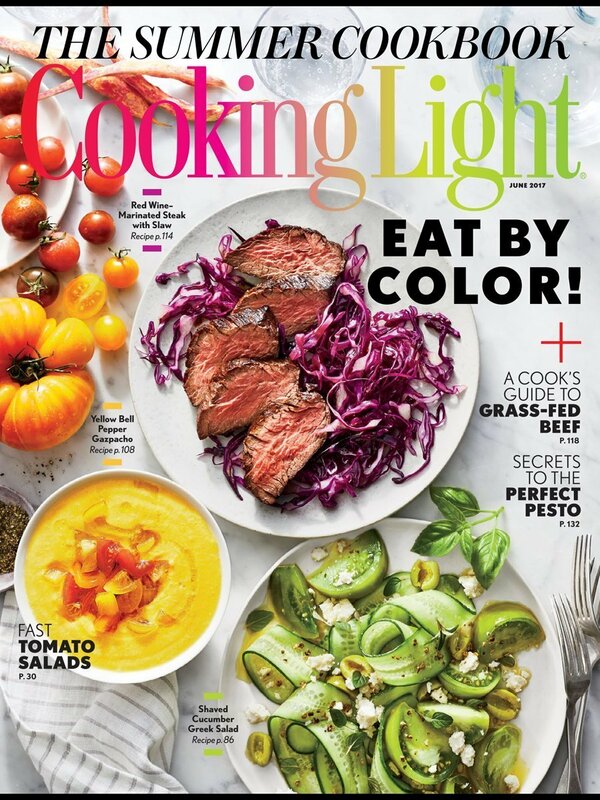 Well now I'm going to pick up a copy of Cooking Light next time I'm at the store! And random question- what kind or brand of deep freezer do you have? We've been looking at them so we can buy meat in bulk, too! What Desiree said! I'm always looking for affordable, cute clothes for Mason too (LOVED your suggestion on the Children's Place shorts for Mason. I'm loving the chino style ones and such a good price!) so share away! Also, can you recommend a good brand and flavor of kombucha for a newbie? I just bought the trilogy flavor (I forgot the brand now lol) the other day and am excited to try it! I loved this post! We would love to buy bulk meat as well...now that we finally have a basement(or even room in the garage....) we can finally get a deep freeze to be able to do it! Though Jim always jokes about the time his family bought "Midnight"- that was the name of the cow, lol- and it tasted funny the whole time they ate it. Here's hoping that doesn't happen again!